Pirates of the Caribbean here in the Philippines is like Harry Potter in fame. As early as 10AM, most of the last full seats (10:30PM) were reserved or already purchased. As expected for a film that brought a trilogy that a lot watched. So is a fourth film worth it? First of all, the fourth film, On Stranger Tides, is not a continuation of the trilogy. 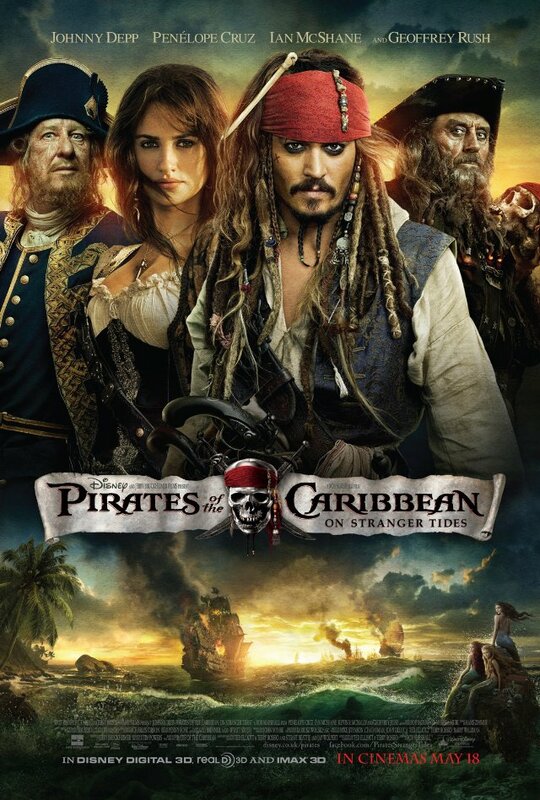 It mainly showcases the comic-relief protagonist Captain Jack Sparrow which I believe is the main selling point of the Pirates of the Caribbean franchise. The absence of Will Turner and Elizabeth Swann helped prevent a rehash of the first three. Having Rob Marshall instead of Gore Verbinski had the fourth film sailed on a different direction. There story was pretty much straight forward but some twists assured that it will not be predictable. If ever you feel that there's a plot hole somewhere, you can head over to IMDb.com because a lot of fans there were defending the film with a valid point. As expected with Johnny Depp, his portrayal of Captain Jack Sparrow was superb, it's like he's always in character the delivery of the humor is spot-on. Penélope Cruz added more spice to the film. Her exotic look and accent fits well and her tandem with Depp was in chemistry. Also, the other characters' portrayal and development (especially that of Sam Claflin (Philip) and Astrid Berges-Frisbey's (Syrena) sub plot) were well written. The musical score was top-notched, as expected from a Disney film. The movie was filmed in Dolby Digital Surround 7.1 and watching it on DTS theater house is worth it. Just like the other films from the franchise, the music enhances the dramatic scenes and boost the humor. All were properly composed and executed. I haven't watched the film in 3D due to financial reasons (3D here is expensive) but some say it was't worth it. In conclusion, the film is a good popcorn flick that packs a punch in humor and a decent story but to serious movie goers it may be sequel that wasn't necessary at all and the franchise is losing its magic. "some say it wasn't worth it." -kasama ako sa some! haha.